This chocolate chip cake will be sure to satisfy all chocolate cravings! Before I started writing my food blog, I tore recipes out of magazines at every opportunity. I stuck these, together with recipes from friends in a file – to be forgotten forever. Or so it seemed. The weekly food challenges have mostly been based around testing these recipes, adapting some of them and sharing my experiences. My friend Bev is one of the best bakers I know. She experiments with her baking and she makes the perfect Pavlova. These are so good, that she sells them at a local shop. I have an extremely sweet tooth, and a habit of having to eat a piece of cake every night. Usually I bake a basic chocolate cake and sometimes I jazz it up a bit. 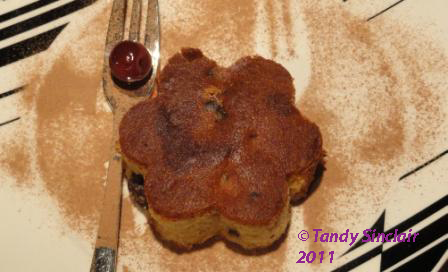 This week I have adapted a recipe from Bev which she got from the Australian Women’s Weekly. I cannot tell you which edition this is from but I printed the email in June 2006. The original recipe is for a loaf tin, and uses almonds but as I do not have a loaf tin I used a rectangular tin. I have substituted the almonds for sour cherries and the flavour combination is great. I could not wait for the cake to cool, and the first bite was of melting chocolate and warm sour cherries. Your presentation is beautiful and since it contains chocolate is absolutely perfect for me! Hmm… all this flattery ….what are you after asks Bev! Would be great to have a chat with you over a cup of tea and a big piece of this superb cake.